While campaigning for new crosswalk signs at the intersection of College and Main, I’ve leaned that most Bluffton residents would prefer a traffic signal at this location in front of our high school and public library. Yes, we used to have one…. Well, a new traffic study is in progress. Data was collected earlier in September and is under review by the Ohio Department of Transportation (ODOT) office in Lima. I’m hoping that the timing–in good weather, during a busy period for after school sports and library use–will prove to be a more accurate reflection of peak pedestrian activity than the last study. While this is happening, I’d like to know why our common sense tells us something different than what ODOT sees. So I took a look at the calculations for the January 7, 2008 study and I asked friends to check the math. 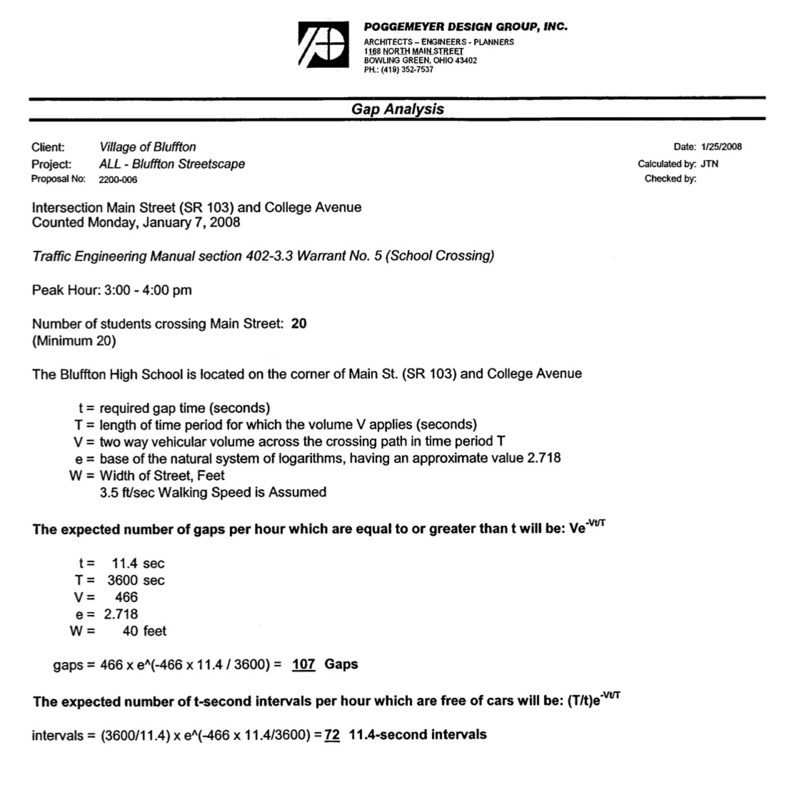 They noticed that adult walking speeds of 3.5 feet/second were used rather than student speeds. That certainly describes a school zone crosswalk where elementary, middle and high school students need to cross Main St. Since school has begun, I have also observed adults with slower walking speeds and individuals using motorized wheelchairs at this location. Readers, if you’ve stuck with me for this explanation, thank you! I know this is more information than most folks want to hear. Can we find a bridge between common sense and statistical analysis? Stay tuned for future updates!